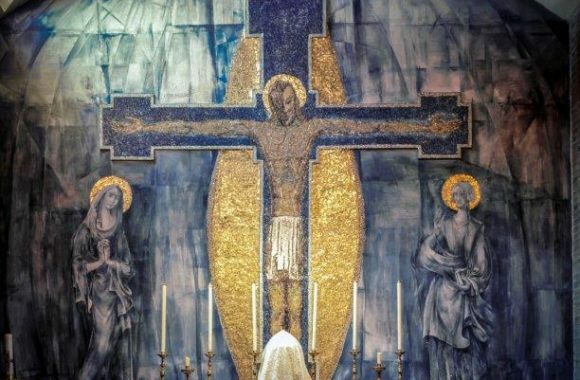 The Twentieth Century Society is giving its support to a campaign to save an outstanding 1950s mosaic of the crucifixion which is under threat because the Roman Catholic church where it is displayed in Oldham, Lancashire, has been earmarked for closure. Mayer-Marton (born Hungary 1897, died Liverpool 1960) was one of Britain’s very few experts in the art of face (or facetted) mosaic with his work held in major collections at the British Museum, the V&A, the Scottish National Gallery, the Walker Art Gallery and the Belvedere Gallery in Vienna (Austrian National Gallery), as well as in private collections. Following the Anschluss (annexation of the country by Nazi Germany), he and his wife escaped to Britain in 1938. Almost his entire life’s work was destroyed in the Blitz in 1940. He worked as a lecturer for CEMA the predecessor of Arts Council until 1952, when he was appointed as a lecturer at the Liverpool College of Art. There he established the Department of Mural Art. The course in this technique which he instigated at the College was the first of its kind in the U.K.
During his time at the college he completed more than 200 oil paintings and he was commissioned by the Roman Catholic Church to carry out works at a number of churches in Lancashire and Cheshire, completing numerous frescoes and mosaics, one of which, the Pentecost, now resides in the Metropolitan Church of Christ the King in Liverpool. The Byzantine mosaic method Mayer-Marton employed is believed to be its first use in this country. 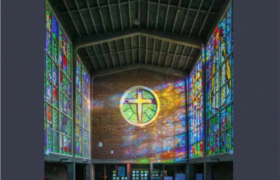 The Crucifixion mosaic and mural in the Holy Rosary Church in Oldham was completed in 1955 and is one of his most significant and historically important works. The work consists of a large (estimated at 7.5m) mosaic representation of the Crucifixion, with the elongated figure of Christ in golds and tans against a dark blue cross and a solid gold mandorla. The mosaic was originally surrounded by wall paintings (estimated 3m high) depicting the figures of Mary and John the Apostle against a background of various shades of blue. Historical photographs show that the wall painting extended over the entire wall, but in the 1980s the fresco element was overpainted. A recent technical report has concluded, however, that it would be possible to uncover the original wall painting and to restore the work to its original conception. The mosaic element remains in good condition. Elements of Expressionism and Cubism are apparent in the work, which reflects Mayer-Marton’s characteristic chromatic modulation of colour and his feeling for structure and form. 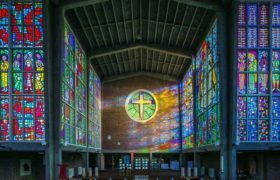 Holy Rosary Church has been earmarked for closure as part of the Roman Catholic Church’s reorganisation of the Diocese of Salford. C20 Society is not seeking to list the church itself. For those of you who are early risers, you may wish to tune in to ‘Sunday’ on Radio 4 at 7 a.m. on 2 April when Catherine Croft, Director of C20 Society, will be speaking about this story.